Surfers do more than surf. The Surfrider Foundation, originally formed to protect a surf beach and beach access, has developed into an international organization involved in multiple programs ranging from wildlife protection to ocean policy. As a surfer and a long term member of the foundation, I have been involved in countless beach clean-ups. We routinely walk the beaches pulling plastic bags, bottles and cigarette butts. Over the years, we have picked up tons of trash. Some of the beach clean-ups are organized, and sometimes I just pick up trash before or after surfing. This Saturday, September 17, Surfrider will join thousands of Californians for the California Coastal Cleanup Day. 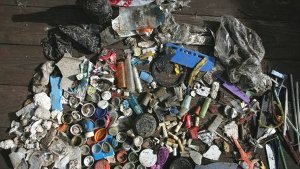 As awareness increases, we are seeing fewer large pieces, but we still find countless cigarette butts, bottle caps and water bottles. We need to do more than just clean up, we need to stop it at the source. Our foundation has developed a plastics campaign called, “Rise Above Plastics.” We must stop the plastics before it hits the beach. It is easily done. A metal water bottle, reusable shopping bag and an ash tray would significantly reduce plastics in the environment. Plastic is forever, with virtually every piece of petroleum-based plastic ever made still in existence. That’s why it’s so critical to our oceans and beaches that we dramatically reduce our use of plastics, especially single-use plastics, starting today. – Using reusable bottles for my water and other drinks. By using just one reusable bottle, I will keep 167 single-use plastic bottles from entering the environment. – Using cloth bags for groceries and other purchases. For each reusable bag I use, I will save approximately 400 plastics from being used. – Recycling the plastic bags and bottles I already have. For every thirteen plastic bags I don’t use, I will save enough petroleum to drive a car one mile.